The State of Texas and Canton ISD has adopted rules and regulations pertaining to trespassing on public school property. 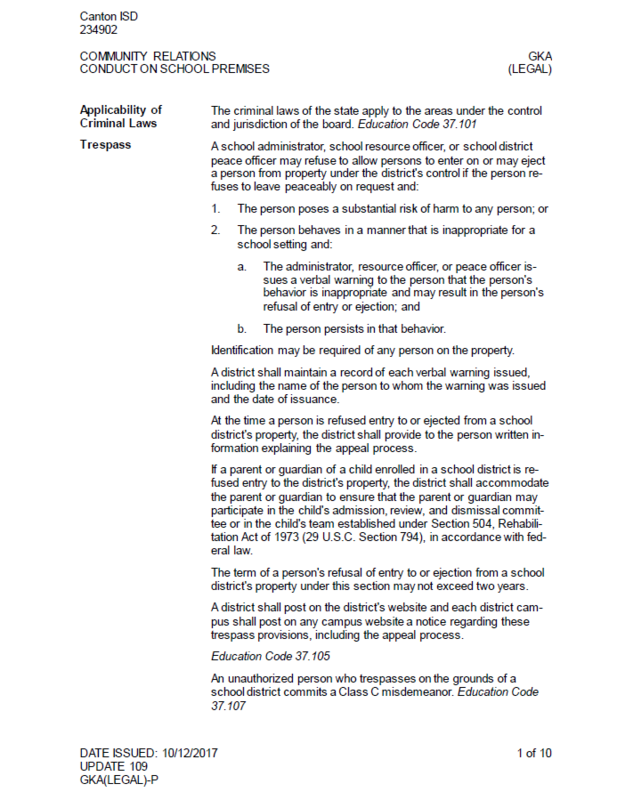 Canton ISD may eject a person from a school district's property and refuse entry to district events for up to two years if the individual engages in behavior including, but not limited to verbal assault, physical assault, threatening physical assault, or any behavior that is inappropriate for a school setting. Provided below GKA(LEGAL) and GKA(LOCAL) which will explain the districts trespassing policy. FNG(LEGAL) and FNG(LOCAL) will give in detail the districts appeal process.